Yet lo and behold, the chain is launching a special-edition Halloween-inspired menu item called the "Nightmare King," which has a vomit-green bun and is apparently "clinically proven" to terrify people as they sleep. "In reality, the study the burger chain commissioned to find out if the green-bunned combination chicken-beef-and-bacon burger caused nightmares was not created to prove anything, clinically or not", LiveScience reported. No word on what makes the bun green... sketchy. 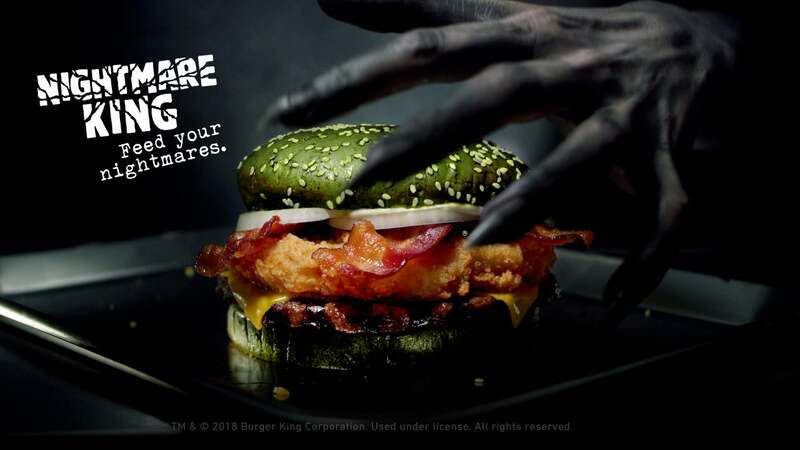 Regardless of how this burger works its magic, the Nightmare King is set to arrive at participating restaurants on October 22 for a limited time. "Someone in my dream turned into the burger". Dr. Jose Gabriel Medina, a specialized somnologist, gleaned from the study that the "incidence of nightmares" increased by about 3.5 times for those who ate the Nightmare King before bed, according to an online statement. If you were planning on eating a combination of three meats before bed, heck, you might as well do it in this convenient burger form, right? "Someone. transformed into the figure of a snake", reported one of the study's subjects when asked about her dream. Are you willing to see what dreams may come from this spooky concoction? LiveScience also reports that because all 100 participants ate the burgers, there was no control group for comparison.